This is my favorite hummus recipe! With a few simple tricks, you really can make creamy smooth homemade hummus and yes, we really do think it’s better than store-bought. Jump to the Easy Hummus Recipe or watch this quick video showing you how we make it. In the past, if we were in the grocery store you could almost bet that one of us would throw a tub of hummus into our cart. That was until we figured out this simple hummus recipe that we honestly believe is better than anything we could have found at the store. Bonus it’s made with real and healthy ingredients, plus it is vegan! Just so we are all on the same page, let’s talk about what hummus is. 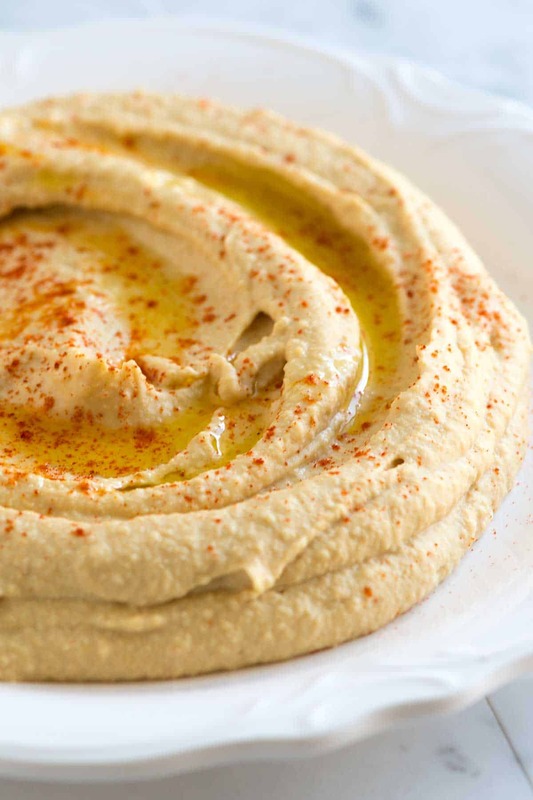 If you aren’t familiar, hummus is a delicious spread or dip made from chickpeas, tahini, lemon, and spices. It’s commonly eaten in the Middle East and the Mediterranean. 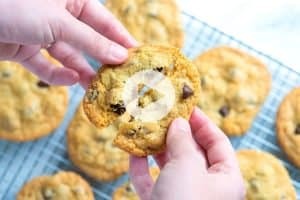 Here in the US, you can find store-bought versions at the grocery store, but we think you should skip those and make your own. Let me show you how! Chickpeas (or garbanzo beans) are the base for hummus. The softened beans breakdown into a smooth paste. You can use canned or home-cooked chickpeas in our recipe. 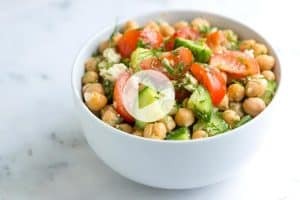 I use them interchangeably and give home-cooked chickpeas a slight edge when it comes to the flavor (here’s how I cook them). 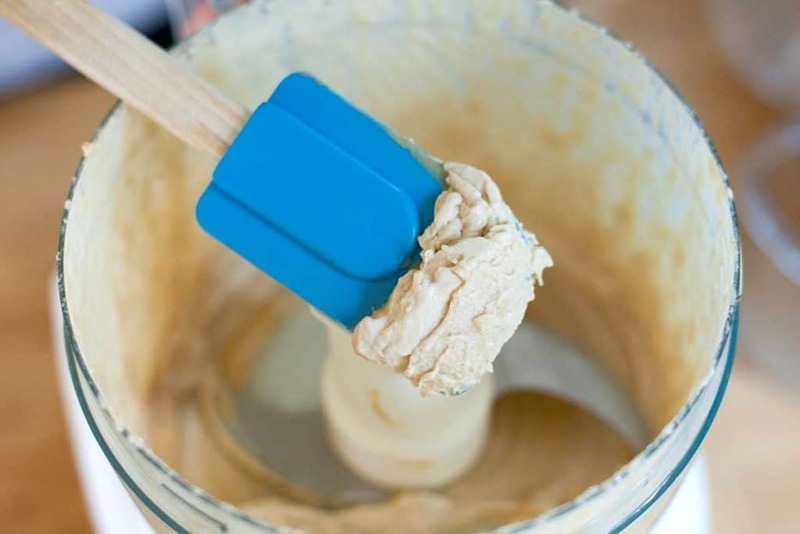 Tahini is a paste made from ground sesame seeds and it makes the hummus taste incredible. You can buy tahini at the store or you can make it yourself. 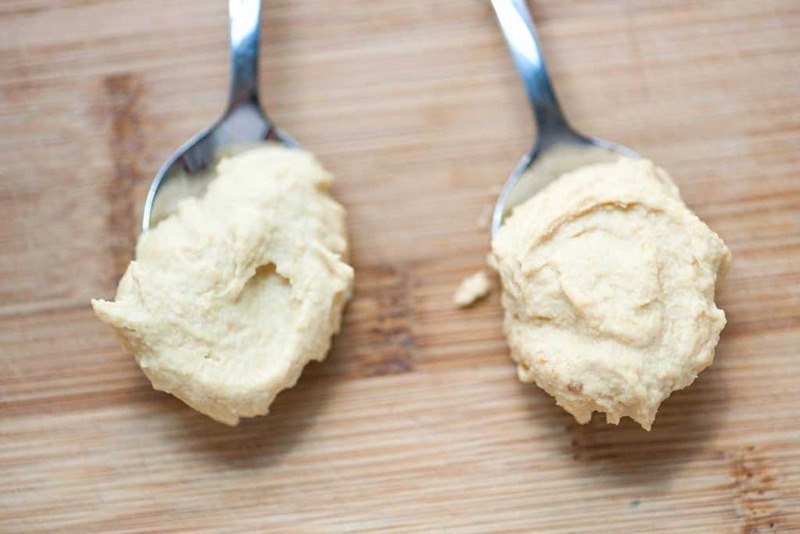 To make hummus that’s 100% from scratch, we use homemade tahini. It’s ridiculously easy to make yourself. 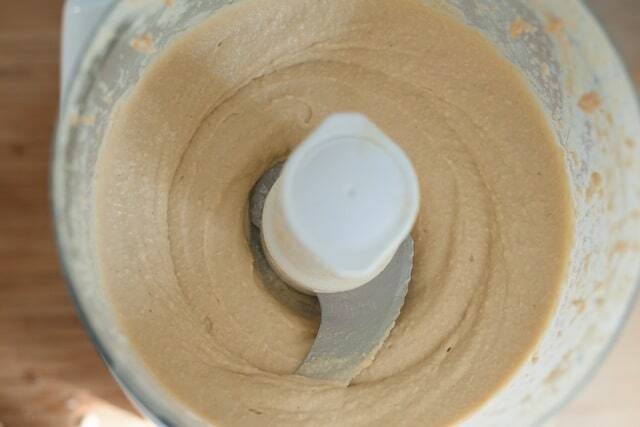 Here’s our tahini recipe with a video showing how to make it. It lasts up to a month in your refrigerator and our recipe makes enough tahini for two batches of hummus. Making hummus without tahini: In the hummus-loving world, there are two camps. Some love the zesty, tangy flavor of tahini, others could really go without it. We like it both ways, but for the best hummus rivaling our favorite brands in the store, we include tahini. If you want to make hummus without tahini, simply leave it out. A chickpea purée without it is still quite delicious. Just add more olive oil. Another option is to use a natural unsweetened creamy peanut butter in its place. Fresh lemon juice is really important for excellent hummus. Bottled lemon juice does not taste nearly as good. Fresh garlic adds a little spice and zest. I add one small clove and find it’s just right. You can also experiment with using roasted garlic for a roasted garlic hummus. You can see how we roast garlic here. Ground cumin and salt help to make it taste amazing and the cumin adds a little more spice and richness. Olive oil makes the texture of the hummus luxurious. We also add a little drizzle to the top of the swirly hummus when we serve it. I really like using fruity, light flavored olive oils when making hummus. So, What’s The Secret For Making The Best Hummus? See the photos below? 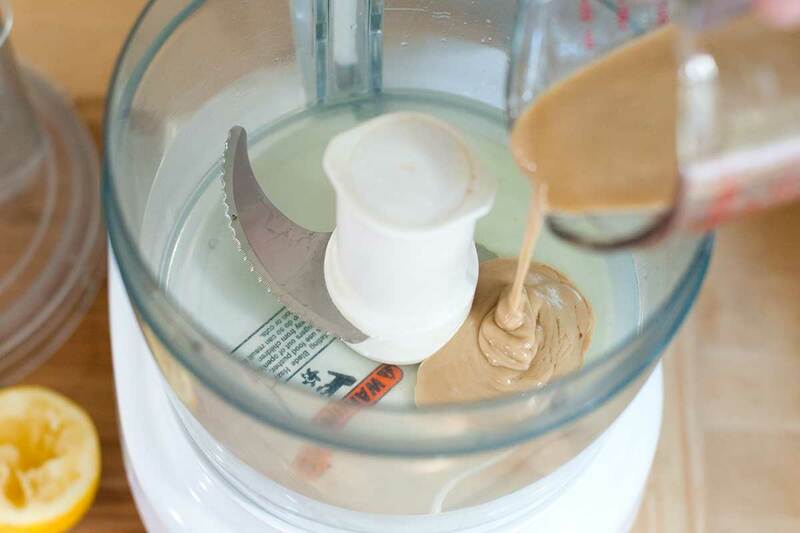 In the first one, we’re pouring tahini into a clean food processor. After a minute of being whirled, whipped, and creamed in the food processor it turns into the paste you see in the next photo. It’s lighter in color and much thicker. For the creamiest hummus, we add tahini and lemon juice first. After a minute of processing, the tahini and lemon juice turns into a thick, whipped paste. Cold water is our last trick for fluffy, creamy, whipped hummus. After all the ingredients are added and we’ve processed into a smooth paste, I love to drizzle in some cold water with the processor still running. The water (and extra process time) turns the already pretty smooth mixture into a fluffy, luxurious dip! Did you know it’s easy to cook dried chickpeas? 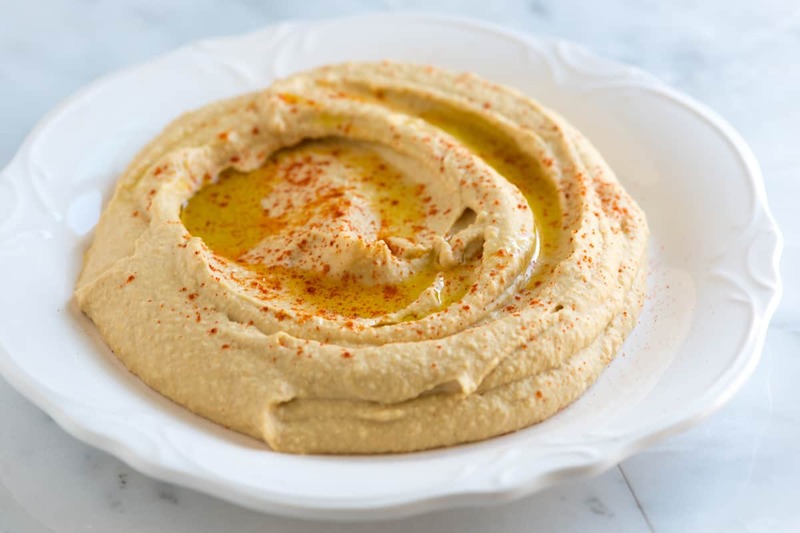 You can use canned or home-cooked chickpeas for this hummus recipe. To see how we cook dried chickpeas, see our simple tutorial here. 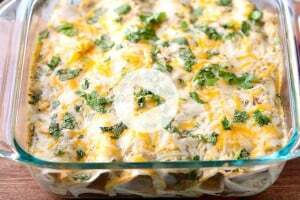 We have included three methods including how to do it in a slow cooker. If you don’t believe that our recipe helps you achieve perfect hummus at home, take a look at what our readers are saying about the recipe! More reviews are in the comments section below. Did you enjoy our easy hummus recipe? Might we suggest you take a look at more of our easy appetizer recipes. Try our Easy Hummus Recipe with Spiced Beef, we use the same method for making hummus, but spoon spiced beef (or lamb), feta cheese, and fresh mint on top. Our Roasted Red Pepper Hummus is extra creamy with roasted red peppers added. We love these Chicken and Hummus Lettuce Wraps because they are easy, healthy, and so tasty. There’s extra smooth hummus on the bottom, fresh cucumber, bell peppers, parsley, feta cheese, chicken, and a drizzle of tahini sauce on top. These Mini Appetizer Cups are filled with hummus, cucumber, and a little tomato. Or, try making this Dreamy Tahini Sauce which can be used on just about anything — salads, vegetables, meats, falafel and much more! Homemade hummus is very easy to make and it tastes much better than anything you can buy at the store. If you don’t have any tahini, a paste made from sesame seeds, you can try making it yourself (see our Easy Homemade Tahini Recipe) or leave it out. A chickpea purée without it is still quite delicious. Just add more olive oil. Another option is to use a natural unsweetened creamy peanut butter in its place. We love serving this with flatbread — here’s our easy flatbread recipe from scratch. Add the olive oil, minced garlic, cumin, and a 1/2 teaspoon of salt to the whipped tahini and lemon juice. Process for 30 seconds, scrape the sides and bottom of the bowl then process another 30 seconds or until well blended. Open, drain, and rinse the chickpeas. Add half of the chickpeas to the food processor and process for 1 minute. Scrape sides and bottom of the bowl, then add remaining chickpeas and process until thick and quite smooth; 1 to 2 minutes. How to Cook Chickpeas: You can use canned or home-cooked chickpeas for this recipe. To see how we cook dried chickpeas, see our simple tutorial here. We have included three methods including how to do it in a slow cooker. If you love a strong garlic flavor in hummus, you might want to increase the garlic by a clove or you can add roasted garlic — here’s how we roast garlic.